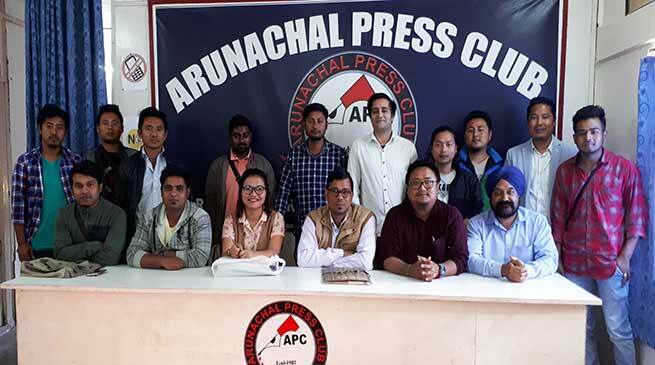 The Executive Body meeting of Arunachal Electronic Media Association (AEMA) held at Arunachal Press Club here today and discussed several issue related. The meeting held under the chairmanship of its President Mukul Pathak, General Secretary Sapna Tayum and discussed various issue of the electronic media did digital media and other issue of the association. The meeting wherein several speakers spoke on several issues like to press upon the government of Arunachal Pradesh for preparation of broadcasting policy of state, Installation of TRP machine, inclusion of local electronic/digital media and channels of state in the advertisement and broadcasting of festivals and fairs to the general masses unlike other national and regional channels. Registration etc. The meeting decided to file a memorandum for the Advertising Policy to the Tourism department for the calendar festivals of the State. Few vacant post of the organisation also filled up.